In cases of iTunes not recognizing iPhone on Windows 10 or Windows 7, chances are that a key component – Apple Mobile Device USB Driver Windows 10 is missing or somehow went wrong. There're 2 workarounds to this problem: Either find another iPhone backup software for PC, or that you can uninstall & install Apple Mobile Device Service all from the beginning. How does AMDS work to connect iPhone Xi/XS/X Plus before to iTunes, however? This page below will walk you through quickly. 3. How to Install Apple Mobile Device Service? 4. How to Uninstall Apple Mobile Device USB Driver? Apple Mobile Device USB Driver Missing? Looks After iPhone Data without iTunes! Create playlist, delete music & DIY ringtone, etc. To enable an Windows OS to interact with an Apple iPhone 8, iTunes would install Apple Mobile Device USB Driver and a set of other background processes when it's first downloaded to an Windows 7 – thus landing the Windows counterpart of iTunes for Mac in a much larger size. Speaking of Apple Mobile Device Service as such, it is a must-have if your iPhone, iPad, or iPod touch is to be synchronized with the computer. There are cases when a stop & start process returns your iTunes back to normal, but in other cases you'll need to reinstall iTunes all from the start. For now, the majority of iTunes software run with Apple Mobile Device Service version 6.1.0.13. You may also consider this free iTunes alternative for Mac. Apple Mobile Device USB driver is one of the 10+ background processes when you download and install iTunes for a Windows (10) computer. AMDS decides whether or not your computer can interact with an iPhone 8 properly. Step 1: Keep the iPhone away from your Windows computer, and then connect them two. Close the iTunes Windows if it prompts out. And tap the Enter key. 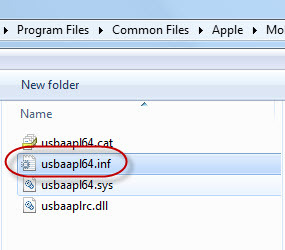 For 64 bit Windows OS users, please click usbappl.inf > Install. (1) To Navigate to the files with *.inf abbreviations in Windows 7, you may click on "Organize > Folder and Search Options > Hide extensions for known file types." (2) How to make sure Apple Mobile Device USB Driver is successfully installed on computer? Step 1: Press "Windows + R" on the keyboard, enter devmgmt.msc to visit the Device Manager. 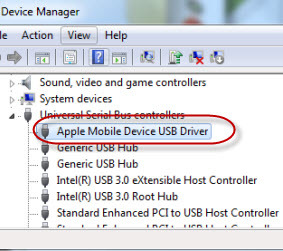 Step 2: Scroll down and click to unfold the "Universal Serial Bus Controllers" to see whether or not Apple Mobile Device USB Driver is in the list. You're good to go with the driver downloaded, but if there isn't such an item in the list, please try another USB cable; If there's an error mark next to Apple Mobile Device USB driver, please reinstall the abovementioned *.inf file, or check through third-party security software. To reinstall the latest version of iTunes for Windows 10, first uninstall the old version under Control Panel, find a valid iTunes software from official Apple's website and download the installer, then just follow iTunes' installation wizard to complete. Step 1: Log in onto your computer as the administrator, connect iPhone to computer without launching iTunes. Step 2: In the start menu, find "Device Manager" and press the Enter Key. Step 3: Locate to Apple Mobile Device Service, if you see a question mark next to the icon, right-click on it and choose "Uninstall", then "OK" on the newly-opened windows. Step 4: Also under the Device Manager, locate the Universal Serial Bus controllers > right-click on it and select "scan for hardware changes". By doing this, your Windows computer automatically install the necessary drivers and will detect iPhone 8. If you see a exclamatory mark next to the AMDS icon instead, right-click on it and hit "Enable". 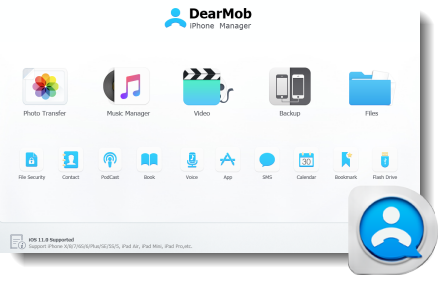 DearMob iPhone Manager can help you easily manage iPhone files without iTunes! Time to wave goodbye to the redundant experience with iTunes that can easily lead to iTunes errors. Why not try out this best iTunes alternative for Windows and Mac to manage your iPhone files? Easily manage iPhone photos, music without iTunes. No extra plugins required to export files from iPhone. Superfast transfer speed without data loss.
" Trying to connect my iPod to computer yesterday, but the iPod screen is frozen with the "Connect to iTunes" icon. I can turn it off (black screen) but as soon as it is attached to the PC or docked, the same icon reappears. I cannot make the red slider appear to shut it down." " The computer insists on my installing the driver for Apple Mobile Device (Recovery Mode), and by the time I check through the Device Manager, there're an "?" and a "!" on the AMDS icon, I'm just at the end of my rope……"
Step 1: Keep your iPhone 8 charged throughout the night. Try to reset the iPhone first by holding the switch button and home button until an Apple's icon appears. Step 2: Connect iPhone to computer in recover mode, to do this, please first disconnect iPhone from computer with iTunes off, and then re-start iTunes. iPhone 6s and earlier: Press-hold the sleep/wake + home buttons at the same time until you see the Apple logo, and then the recovery mode screen. 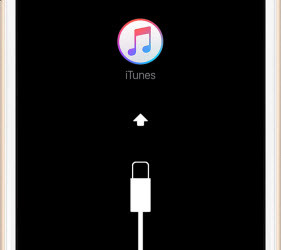 Force start iPhone X, iPhone 8 (Plus) or iPhone 7: Press-hold the sleep/wake + volume down buttons until you see the Apple logo, and then the recovery mode screen. Step 4: On iTunes when you see the box saying " There is a problem with the iPhone "iPhone" that requires it to be updated to restored." Choose "Update", which helps re-install iOS without erasing your personal data. Wait for the new iOS software to be downloaded to your iPhone through iTunes. Usually it takes about 15 minutes for your device to exit recovery mode, but still more for the download to finish. Then set up your iPhone all over again. 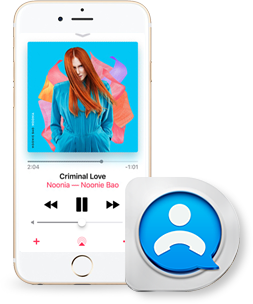 By design, Apple Mobile Device Support is a key software component for iTunes to interact with iPhone. The giant, complex component system sometimes retards iTunes, making iPhone to computer transfer sluggish and lengthy. That been the problem, DearMob iPhone Manager is smart way out to manage iPhone data from PC/Mac, click to free download it below! 1Transfer Old iPhone to New iPhone? Is it difficult to transfer iPhone to new iPhone including all music, photos, contacts without much hassle? Here introduces top 5 ways to transfer old iPhone to new iPhone & backup your important data, especially photos and music either with a cable or wirelessly. Here we introduce you a dummy-proof way to enable iPhone disk mode and use iPhone as a USB flash drive to transfer files between Windows and Mac computers. Connect iPhone as a storage device to transfer word documents, zip files, Excels, PowerPoints, and more. How to transfer videos from iPhone to Mac? Find the best way here to move music/recorded videos, movies or TV shows from iPhone XS/Xi/X Plus etc to MacBook Air/Pro, iMac, iMac Pro, etc for secure backup and to free up iPhone.